Nasa has nothing to do with making a good sourdough culture, nor has dancing in the moonlight! Use steam! Using steam (spray water on the sides of your oven, be careful not to damage your oven by spraying on electrical things) during the first 8 minutes in the oven gives the bread room for expansion and forces the enzymes in the crust to give your bread a nice color! Use a dough scraper, they are great for dividing dough and for dough folding, especially with wetter dough! Make your own sourdough culture. There are lots of articles about sourdough. Some are very technical and elaborate talking about sourdough starters as if the are designed by Nasa and need the upkeep done at moonlight, dancing around Stonehenge. All you need is unbleached organic flour, water, a jar and a spoon. 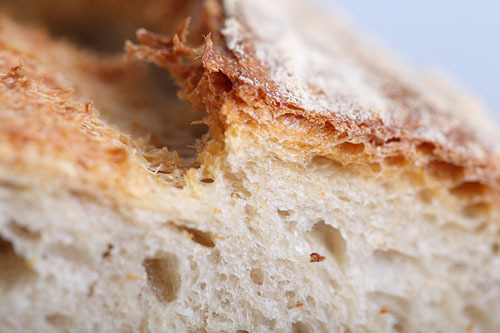 Read our instructions on how to make your own sourdough culture. I have a Thermador wall oven that has Bake, Convection Bake, Convection Roast and true convection choices. I think the true convection is fan with an element alone. Convection Bake is both elements and the fan without its heating element. True convection is with the fan and its element only. Convection Roast is both elements and the fan with its heat element also. I normally use the convection Bake @ 450-500 degrees and I use a large pizza stone and spray water early in the bake. What are your thoughts? It is our personal opinion that it would be best to bake bread without using any fan at all. If it is not possible to bake with the elements only with your oven settings we would choose the option Convection Bake too. Perhaps you could also block the fan in some way. But you do not write about your results baking like you do now, so we are not sure if you actually having problems with your baking results?! Haven’t made bread since last summer… by hand or in my breadmaker. You make me want to get started again. Maybe one day…. I see you have some impressive artistic and food qualities yourself! I am going to give those orange and white chocolate cookies a try really soon. Your blog is dangerous! I come here and want to eat everything!! The bread looks absolutely breathtaking!